Christmas is my favorite holiday of the year. Family, friends, food, parties, presents! What a great season to appreciate blessings of the year and show love for people that mean the world to you. And I am not going to lie, I just love receiving cards and gifts as much as I love giving them! 1) Christmas is over. Does that mean all of us will go back to the business of going on about with our lives, be completely consumed by it and let an entire year pass by without showing appreciation for each other? How nice the world would be if it was like Christmas every single day! 2) This is the first holiday season where I did not receive a single Christmas card in the mail. 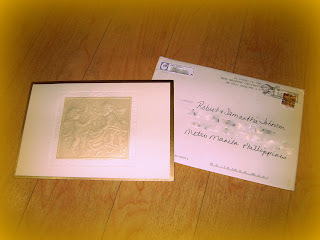 You know, the traditional, stamped one where you find a handwritten greeting inside? Don't get me wrong, I love all other ways and means to say Merry Christmas but it just made me wonder about a modern trend: has technology gone too far and too convenient? Later in the day, as I tried to go to the grocery store to run a couple of errands, the guard that stays in our building lobby handed me a cream envelope with a stamp from El Paso, Texas. As I opened it, I saw that it was a handwritten Christmas card from our friend Amy! I am truly grateful and inspired by this woman! This act of love has revived my desire to just keep on writing short, handwritten notes every chance I get. Not just on Christmas but on every occasion where my heart feels the need to honor a person that has made an impact on my life. If I truly want live out the "Love Others" part of my life goal this year, I will look for every opportunity to let a person know that he/she is loved and appreciated. I really believe that the most common cause of heartache in humanity in this day and age is the feeling that they do not matter. I hope that all of us make an attempt to cure that today. You said it oh so perfectly Dianne! Snail mail and handwritten cards are "fast becoming lost treasures." Your story quickly reminded me of my childhood when I used to write to my close friends during summer break.